‘Tis always the season for burglary prevention. Burglaries are by far the most common crime in the United States, and a whopping 90% are never solved. It’s an epidemic with a simple solution called Operation Identification. Operation ID was developed in 1963 by the police. This was before the advent of the mainframe computer. After extensive testing, the approach was rolled out nationwide in 1979 by the United States Department of Justice (USDoJ) at approximately the same time as Neighborhood Watch. After the USDoJ rolled out Operation ID, the FBI, police and sheriffs endorsed it. In other words, 24/7/365, there is a strategy that law enforcement professionals developed and endorsed that helps citizens not be victimized. And if citizens are victimized, there is a way for law enforcement professionals to solve the crimes. At MyPropertyID, we provide a modernized version of this strategy in a DIY, mail-order kit, tied to cloud. Burglars know no bounds. They victimize citizens in every kind of neighborhood. Rich, middle-class or poor. Spring, summer, fall or winter. Morning, noon or night. Any day of the week, month or year. There is the constant drip, drip, drip of burglaries. And why do they happen so frequently and broadly across the United States? Burglars know they have less than a 10% chance of ever being convicted. Those are amazing odds in favor of the criminal element. And as often as not, those criminals are teens and young adults from right in your neighborhood. Alarms and cameras definitely have their place, but they do not provide the definitive evidence that leads to convictions. No kidding! This is a fact burglars and police understand acutely. Have you ever wondered why criminals look right at the cameras? There are only two surefire ways to get a conviction. Having law enforcement professionals catch a criminal in the act, and catching a criminal in possession of marked property where the serial numbers are tied to the rightful owner. A good defense attorney can cast doubt on the accuracy of virtually any video footage, even high-definition equipment used in banks. Operation ID is a pretty simple process if you have the right tools. 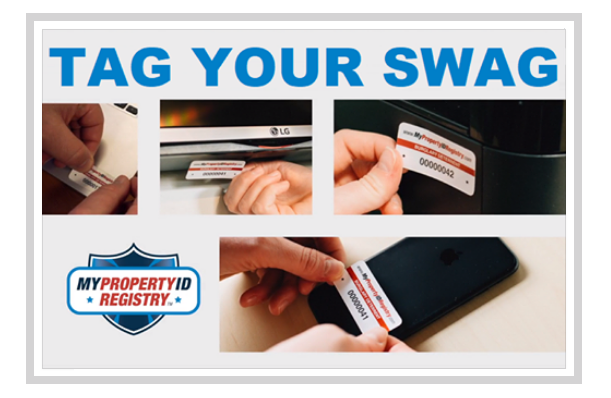 Using the original strategy, you use an etching tool to engrave your driver’s license number and 2-letter state abbreviation into your belongings. You take out a piece of paper and write down the make, model and serial numbers of those items. Finally, you place warning signs on doors and windows you print out at home, work or the library. The Washington D.C. Metropolitan Police Department provides you with everything but the etching tool. For a few dollars, anybody and everybody should participate in Operation ID. At MyPropertyID, we’ve figured out a way to streamline the process and tie the strategy to the web. It’s a onetime cost for the life of the product and it provides the police with the three things they need in the 21st century. 1) The make, model and serial numbers stored in the cloud. 2) A modern strategy to mark property with commercial-grade asset tags. 3) Signs for doors, windows, sheds and cars. It has the added bonus that it works as a lost & found with the help of Good Samaritans, and there is a way to email serial numbers to the police from anywhere on the planet where you can access the web. SAFETY • TERMS • PRIVACY Copyright © 2016-2019 PaxAux, L.L.C. All rights reserved.